In the fall of 2006 Virginia (Jenny) Bonner invited Gerry Giles, then Cobble Hill Regional Director and several others to visit and hear about her proposal for an addition to the Cobble Hill Village landscape. Upon arrival the group was ushered over to the area behind the Cenotaph where Jenny described her idea for an historical wall. 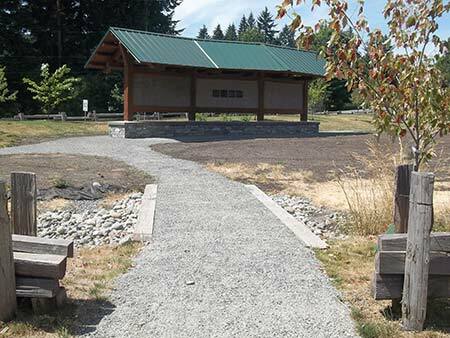 She had seen the memorial wall in Powell River, had researched several others and come to the conclusion that as there was nothing of this nature in South Cowichan, Cobble Hill would be the ideal location for a wall commemorating local people. Her enthusiasm (Jenny was a “force of nature”) was contagious and her audience was immediately interested and keen to follow up on her lead. This was going to require an organization to raise the funds, obtain a suitable site, arrange design and construction and oversee the long term management of the project. They returned to Ralph and Jenny Bonner’s home to discuss the situation further while consuming Jenny’s cookies and lemonade. The following year in October of 2007 the Cobble Hill Historical Society (CHHS) was formed under the BC Societies Act with the wall as its first major goal. Jenny believed the area behind the Cenotaph would be an ideal location and the initial 2008 design for its renovation included a wall site. As the Cenotaph proposal became finalized and the memorial had to be moved to a more central location to protect it, it was apparent that this monument to those who had fallen in service to our country should be the only structure in the new park. The historical society plans were put on hold and the search for a location was resumed. The refurbishment of the Cenotaph site that has become the beautiful Memorial Park was completed in the summer of 2010 and the CHHS carried on with other tasks while continuing to collect funding for the wall venture. The taxpayers of Cobble Hill have generously provided the historical society with the means to realize this objective. Sadly, Jenny Bonner passed away in 2008, but her inspiration remained with the CHHS. In 2010 the old BC Ministry of Highways Works Yard became a Cobble Hill park and was renamed Cobble Hill Common and in 2011 the Cobble Hill Parks Commission and the Cowichan Valley Regional District (CVRD) gave permission for the historical wall to be erected in the Common once this area was ready for development. During the hiatus that occurred while a home was found for the project, it evolved into a plan that is unique not just to our area, but to at least Vancouver Island. 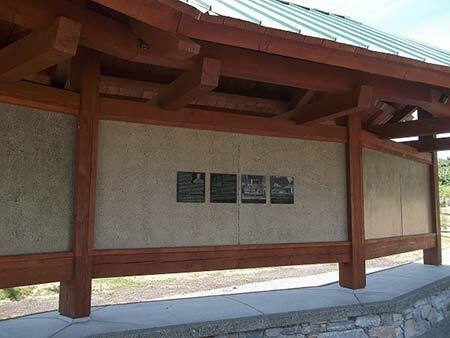 Rather than simply state names and dates (births, deaths or business names and dates), the wall is designed to commemorate people, enterprises and events from pioneer times to recent history in South Cowichan. Pictures with captions or short articles explaining them will give the viewer a real glimpse into our past. The society and the CVRD commissioned Ruth Koehn of Timber Guides Design and Build of Cobble Hill to design a concept that blended with the "Welcome to Cobble Hill” sign kiosk and complimented other village construction. The funding, finalized drawings approved by both the Parks Commission and the CVRD, site preparation and a building permit enabled construction to begin in May of 2014 and after hundreds of hours of volunteer labour with many in kind donations from local businesses, it was completed in November. 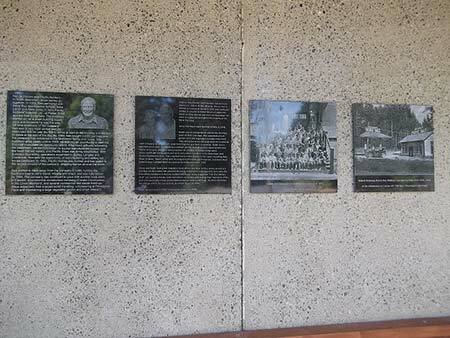 The representations are lasered onto 6 x 12” or 12 x 12” granite plaques and attached to the wall. This venue is an enduring legacy for South Cowichan providing a platform to showcase the lives and times that have formed our community. The Wall officially opened on Sunday, June 7, 2015. 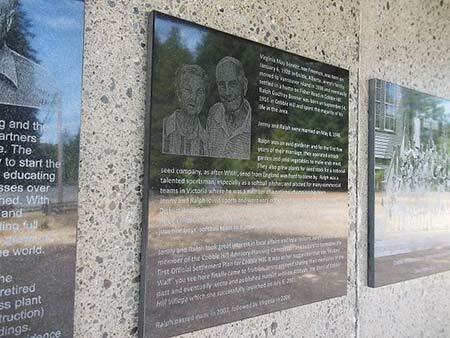 Fittingly, the first plaque commemorates Ralph and Virginia Bonner.